Are you looking to buy a farmhouse or a villa in Italy? Our villas and farmhouses in Italy are situated in idyllic and secluded locations in Tuscany, Umbria, Lazio, Campania and Abruzzo. The plot of land is often spacious and offers splendid views of the surrounding landscape. Some farmhouses consist of several buildings and thus open up for interesting uses and solutions. There is usually an outdoor pool, large terraces as well as fruit- and olive trees on the land. 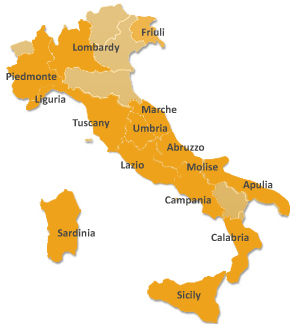 We offer villas and farmhouses in, for example, Val d’ Orcia, in the municipality of San Casciano dei Bagni, Radicofani, Pienza, Montepulciano, Castiglion d’Orcia, San Quirico d’Orcia, plus Val di Chiana (included Cetona, Chiusi, Sarteano, Chianciano Terme).